It was a whole day filled with fun, friendship and gastronomic delights as the Tourism Promotions Board (TPB), the Department of Tourism (DOT), Makansutra and Ayala Malls launched the World Street Food Congress (WSFC) 2016 via a 15-hour food frenzy safari. WSFC is an international culinary affair and will be held in the Philippines for the first time after being hosted by Singapore for the past two years. The five day event will take place at Bonifacio Global City (BGC) from 20-24 April 2016 and will feature the World Street Food Dialogue, World Street Food Jamboree, and World Street Food Awards. Registration for the World Street Food Dialogue is done online at www.wsfcongress.com. 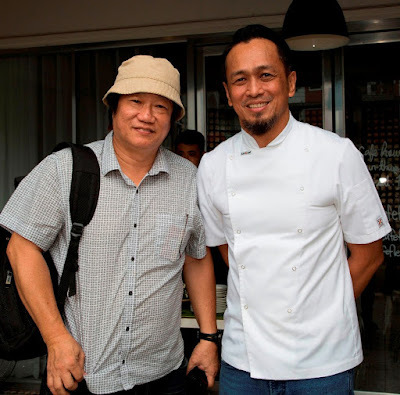 Among those who participated in the food tour were Makansutra’s KF Seetoh, Indonesia’s culinary ambassador Chef William Wongso, Our Awesome Planet’s Anton Diaz, Chef Sau del Rosario, RJ Ledesma of Mercato Centrale and Singapore’s DJ Rosalyn Lee. The street food safari kicked off at 7:00 AM at BGC then proceeded to food stops at Pampanga, Binondo and back to BGC at around 10:00 PM. The itinerary included Recovery Food, Everybody’s Cafe, Aling Lucing’s Sisig, Cafe Fleur, Sarsa Kitchen + Bar and Mercato Centrale Night Market. Traditional favorites such as tapsilog, sisig, kare-kare, lumpia and lechon were among the numerous iconic Filipino dishes the participants sampled during the jam-packed trip. “We are very excited that the Philippines will be hosting the WSFC 2016.This will once again highlight our country as one of the best culinary destinations in the world, and it is an opportunity for us to share to the global audience the richness and contemporary edge of Filipino gastronomy,” shares TPB COO Domingo Ramon C. Enerio III. Considered as Philippine Food Month, April is packed with other major culinary events such as the Madrid Fusión Manila 2016, the biggest and most important gastronomic event in Asia in the 21st century; and Flavors of the Philippines, a month-long food extravaganza that showcases the unique tastes of classic, contemporary and exotic Filipino food from all over the country. For more updates on WSFC 2016 and Philippine Food Month, visit www.tpb.gov.ph.